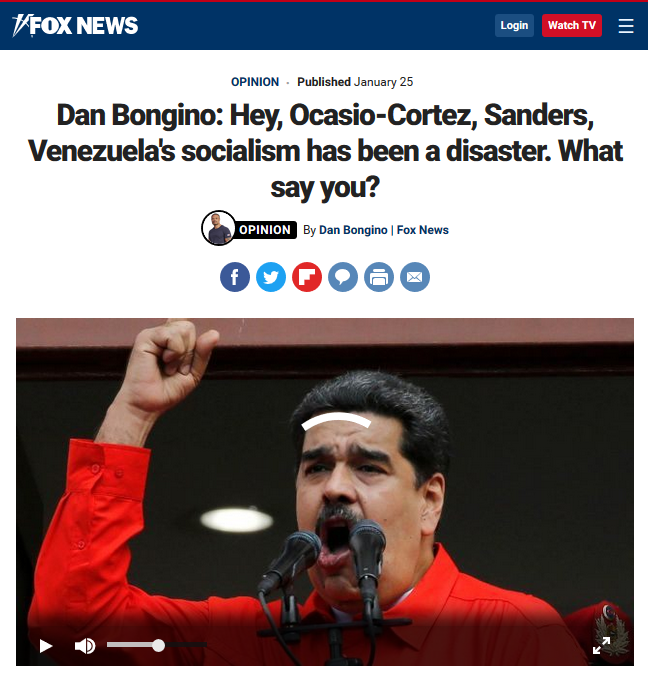 Fox News (1/25/19) makes use of Venezuela to taunt its enemies. Socialism—whatever that means—is in vogue right now. A recent Gallup poll (8/13/18) found that a majority of millennials view socialism favorably, preferring it to capitalism. Democratic socialist Bernie Sanders is the most popular politician in the United States, while new leftist Rep. Alexandria Ocasio-Cortez’s (AOC) policies of higher taxes on the wealthy, free healthcare and public college tuition are highly popular—even among Republican voters (FAIR.org, 1/23/19). Alarmed by the growing threat of progressive policies at home, the establishment has found a one-word weapon to deploy against the rising tide: Venezuela. The trick is to attack any political figure or movement even remotely on the left by claiming they wish to turn the country into a “socialist wasteland” (Fox News, 2/2/19) run by a corrupt dictatorship, leaving its people hungry and devastated. In an article entitled “Bernie Sanders, Jeremy Corbyn and the Starving Children of Venezuela,” the Washington Examiner (6/15/17) warned its readers to “beware the socialist utopia,” describing it as a dystopia where children go hungry thanks to socialism. 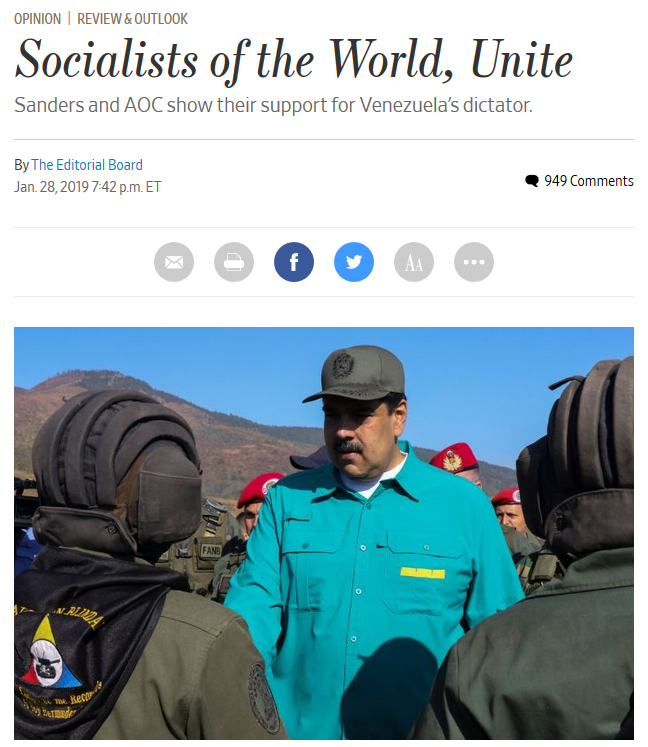 The Wall Street Journal (1/28/19) recently condemned Sanders for his support of a “dictator,” despite the fact Bernie has strongly criticized Venezuelan President Nicolás Maduro, and dismissed Maduro’s predecessor, Hugo Chavez, as a “dead Communist dictator” (Reuters, 6/1/16). Likewise, the local US-backed opposition’s role in the economic crisis is barely mentioned. The opposition, which controls much of the country’s food supply, has officially accepted responsibility for conducting an “economic war” by withholding food and other key goods. For example, the monolithic Empresas Polar controls the majority of the flour production and distribution crucial for making arepa cornbread, Venezuela’s staple food. Polar’s chair is Leopoldo Lopez, national coordinator of Juan Guaidó’s Popular Will party, while its president is Lorenzo Mendoza, who considered running for president against Maduro in the 2018 elections that caused pandemonium in the media (FAIR.org, 5/23/18). Conspicuously, it’s the products that Polar has a near-monopoly in that are often in shortest supply. This is hardly a secret, but never mentioned in the copious stories (CNN, 5/14/14, Bloomberg, 3/16/17, Washington Post, 5/22/17, NPR, 4/7/17) focusing on bread lines in the country. Also rarely commented on was the fact that multiple international election observer missions declared the 2018 elections free and fair, and that Venezuelan government spending as a proportion of GDP (often considered a barometer of socialism) is actually lower than the US’s, and far lower than most of Europe’s, according to the conservative Heritage Foundation. The London Daily Express (2/3/19) demonstrates that redbaiting works equally well on either side of the Atlantic. Regardless of these bothersome facts, the media has continued to present Venezuela’s supposedly socialist dictatorship as solely responsible for its crisis as a warning to any progressives who get the wrong idea. So useful is this tool that it is being used to attack progressive movements around the world. 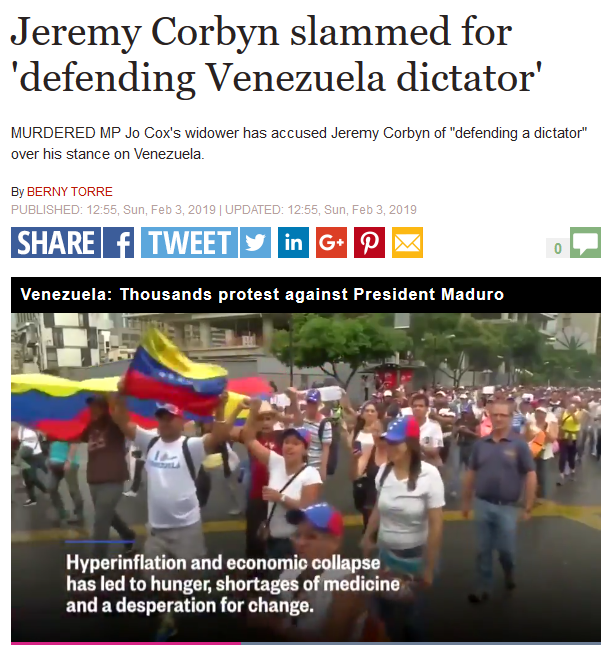 The Daily Express (2/3/19) and Daily Mail (2/3/19) condemned UK Labour Party leader Jeremy Corbyn for his “defense” of a “dictator,” while the Daily Telegraph (2/3/19) warned that the catastrophe of Venezuela is Labour’s blueprint for Britain. Meanwhile, the Greek leftist party Syriza’s support for Maduro (the official position of three-quarters of UN member states) was condemned as “shameful” (London Independent, 1/29/19). “Venezuela” is also used as a one-word response to shut down debate and counter any progressive idea or thought. While the panel on ABC’s The View (7/23/18) discussed progressive legislation like Medicare for All and immigration reform, conservative regular Meghan McCain responding by invoking Venezuela: “They’re starving to death” she explained, leaving the other panelists bemused. President Trump has also used it. In response to criticism from Senator Elizabeth Warren over his “Pocahontas” jibe, he replied that she would “make our country into Venezuela” (Reuters, 10/15/18). The weapon’s effectiveness can only be sustained through a media in lockstep with the government’s regime-change goals. That the media is fixated on the travails of a relatively small and unimportant country in America’s “backyard,” and that the picture of Venezuela is so shallow, is not a mistake. Rather, the simplistic narrative of a socialist dictatorship starving its own people provides great utility as a weapon for the establishment to beat back the domestic “threat” of socialism, by associating movements and figures such as Bernie Sanders, Alexandria Ocasio-Cortez and Jeremy Corbyn with an evil caricature they have carefully crafted.